Created in a calming lilac, Katie Rose has created this gorgeous new baby girls blanket. This blanket is perfect when paired with any Katie Rose romper or gown for a sweet baby shower gift. The design is made in the USA with a soft cotton, perfect for baby. 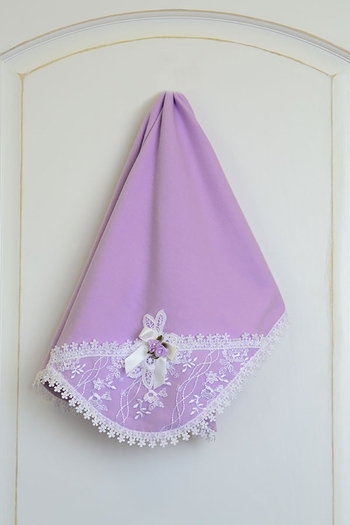 A delicate floral lace trims the blanket completely. Added elegance is found in the single decorated corner. Complete with a lace overlay, flower applique and a satin bow with rose buds at the center. 100% Cotton. Hand Wash Cold. Line Dry. Made in the U.S.A.